(Newser) – Environmental pollution is responsible for the deaths of 1.7 million children under age 5 each year—or one-quarter of all deaths in that age group around the world, Reuters reports. The danger begins in the womb and continues as children are exposed to such factors as dirty air and water, poor sanitation, inadequate hygiene, and second-hand smoke, per a WHO report released Monday. The results can last for life. Some 44% of child asthma cases are believed to be linked to pollutants. Other risks include pneumonia, heart disease, stroke, and cancer. "Their developing organs and immune systems, and smaller bodies and airways, make them especially vulnerable to dirty air and water," says WTO chief Margaret Chan. 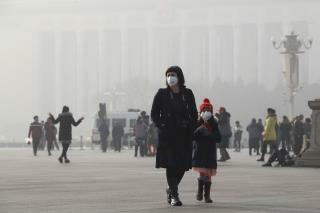 An estimated 90% of the world's population breathes air that falls short of WHO standards, per CNN. China is the world's assembly line. The thing that will always eventually win out over health is trying to keep their incredibly overpopulated masses in jobs. Jobs mean factories. Factories mean pollution! ...We're talking 1.4 billion people! "Good nutrition at schools and more urban green spaces also were recommended" And Republicans are outraged over this suggestion. Figures.